Elisabeth Andree of About Crochet challenged 20 bloggers to design a scarf, shawl, mitts, or cushion cover using one of three stitch patterns with "Chain Single Crochet", also called "Extended Single Crochet". 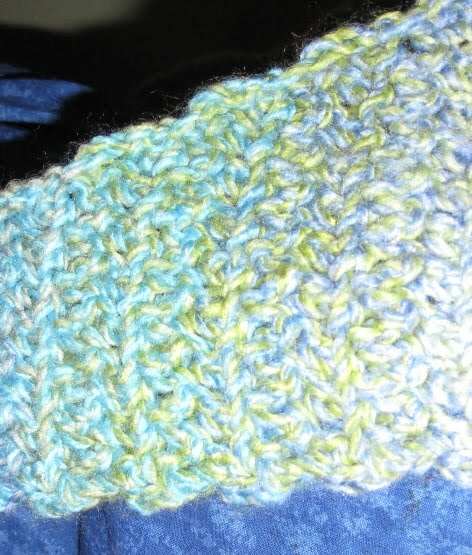 I tried all three stitch patterns and decided I liked Pattern #3 best. With three recent losses in my family, I have been thinking a lot about designing Comfort or Prayer Shawls. I have also been intrigued by the recent trend toward long thin triangular scarves worn bunched around the neck. So I decided to combine the two. By starting with just a few stitches in one small corner, I slowly increased every other row on just one side to the desired height of the triangle, then decreased. The final Sharf measures 74 inches wide by 18 inches long. This shape combined with the natural stretch of the stitch pattern makes it easy to wear spread across the shoulders as a Shawl or bunched together as a nice warm Scarf. The long, thin ends of the triangle allow the wearer to tie the ends together when worn in a variety of ways. 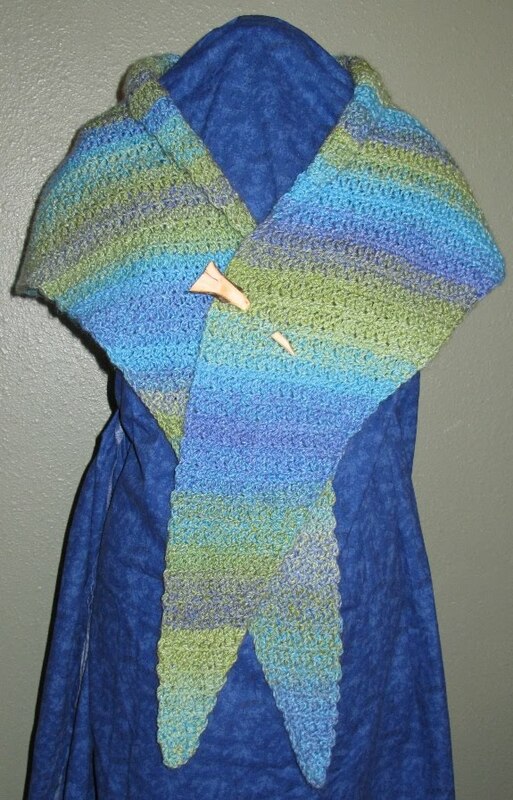 This design used three skeins of Lion Brand Tweed Stripes yarn. The long self-striping colorway worked perfectly with the ridges formed by working in the front loop only. I tried to join each new skein so the colors would blend without interrupting the pattern, and began the decreasing rows at a point where the color stripes would mirror each other from the midpoint. The Tweed Stripes yarn is a thin #5 Bulky weight which I worked up with an I hook. Another #5 yarn which was a bit thicker created a stiffer fabric with an I and worked better with a J hook, so it would not require as many rows to get a similar size. 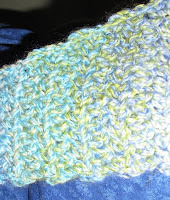 I debated adding a border to the bottom edge, but thought it worked better as a scarf without the added bulk. I also found that working into just one loop of the turning chain at the end of each row, created sort of a natural shell edging. 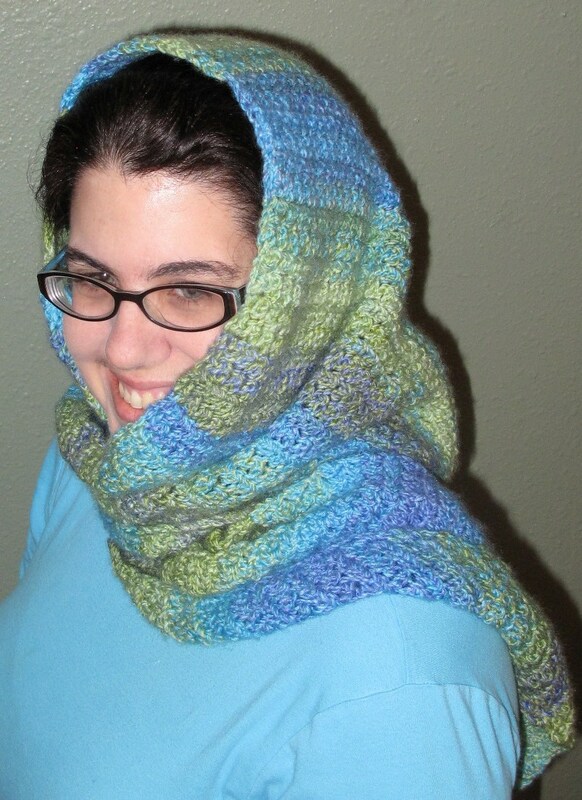 I love the versatility of this design which can be worn as a shawl, scarf, cowl, hood, and even a shrug! I had so much fun finding new ways to wear this simple triangle, that I had to create an entirely separate Blog post on 10 Ways To Wear a 'Sharf', check it out! I really enjoyed the opportunity to learn and design with a new stitch. Thank you Elisabeth for running this fun contest. I cannot wait to see what everyone else came up with!